The theme of the House Democrats' annual retreat this year is "fighting for the people," but they needed a pair of Ivy League professors and a Hollywood power couple to explain to them just who those people are, according to an agenda for the event. The opening event of the House Democrats' three-day retreat at Virginia's Lansdowne Resort was headlined by Harvard's Raj Chetty and Yale's Jennifer Richeson and titled, "Who Are The People?" 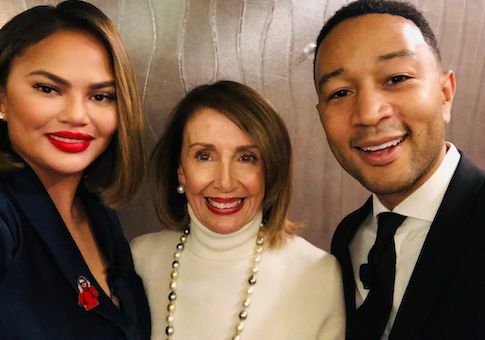 The introductory event was followed by a dinner headlined by celebrity couple John Legend and Chrissy Teigen, who advised women to say "f**k you" more often to President Trump. The agenda was obtained in full by the Washington Free Beacon and can be viewed below. Nearly the entire conference is closed to the press, though there was an off-the-record reception for reporters held on Wednesday night. Speaker of the House Nancy Pelosi wants to use the retreat as an opportunity for Democrats to reset after their first hundred days in the majority. She is reportedly hopeful members will be able to refocus on policy issues they rode to sweeping victories in 2018, rather than continue the infighting responsible for derailed attempts to come together on a budget. The members chosen to lead sessions on policies indicate infighting may be hard to avoid. Representatives Kathy Castor (D., Fla.) and Paul Tonko (D., N.Y.), neither of whom signed on to the Green New Deal, were selected to lead a Thursday session on "Climate Change in the 116th Congress." Both Castor and Tonko have backed climate legislation they say has a chance to win bipartisan support, unlike the Green New Deal. Tonko called his plan "doable." Though many freshman members of the Democratic caucus are featured at the retreat, it's not the ones with "a large number of Twitter followers" who've drawn the ire of Pelosi. Joining Pelosi to give opening remarks for the retreat, for example, was freshman Rep. Jennifer Wexton (D., Va.). Other sessions include one on "staying on message during the Trump presidency" and one on "fiscal responsibility." Beyond the appearance by Legend and Teigen, other entertainment at the retreat includes a professional chef demonstration by Washington, D.C.-based chef Cable Smith and a trivia event hosted by failed anti-Trump comedian Jordan Klepper. Members will also be educated on "effective advertising under franking rules," which allow members to send direct mail to constituents without paying for postage on matters of public concern, but forbids any political mailers. There will be a closing press conference held on Friday morning. All members are invited and "encouraged to stand in solidarity." A spokesperson for leadership did not respond to a request for comment on the agenda.